So I tried this today. You know, sit on one holding the bars with your dominant hand, and place your other hand on the stem of bike No.2 positioned adjacent and parallel to the one you're sitting on. There is no way I am about to attempt to do this on any sort of road - let alone try to navigate my way around the New Cross one way system. My neighbours were in receipt of approximately 3 minutes of unexpected entertainment. For which I was in receipt of a small round of applause. Srsly. I've done this before. Years ago. Without killing myself. TBF, at the time I didn't have shoes with cleats - but I almost certainly did have pedals with toe-straps. Why is it that today it felt like this-is-so-going-to-go-very-badly-wrong-and-end-in-epic-FAIL-in-addition-to-which-Things-Will-Be-Broken? Bike No.2 had a mind of its own, and parted from me, in a manner similar to that of Bambi's legs on ice. Is there a trick to doing this? I built myself one of those too. I know exactly what you mean - it's happened to me. I have ridden with bike No. 2 slung over a shoulder, but I am a bit bigger than a Jurek, and I wouldn't want to do it for more than a mile. 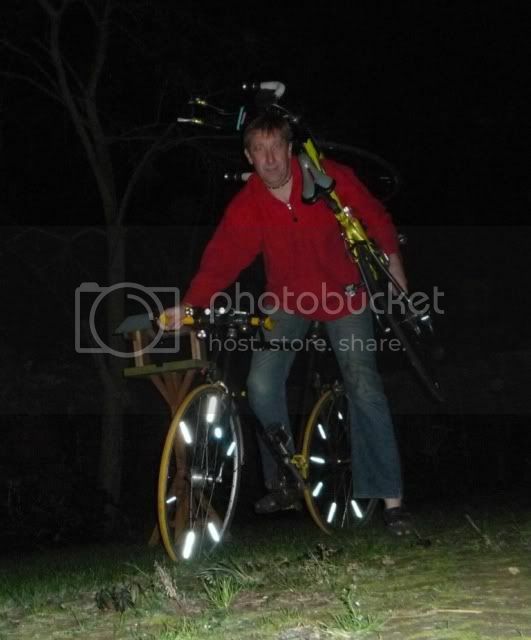 I have considered the Bike-No.2-over-the-shoulder approach - it's a light bike. But the journey is around 5 miles. EDIT - I'm a bit intrigued by your use of the indefinite article (albeit not in an Eddy Izzard kind of way). I've done this as a teenager and it was OK unless the non ridden bike got wobble on when you hit a bump. I used to use a three fingered hold thumb and index and second finger. The trick was not grip tightly/ Probably the bikes I had available then had a much bigger castor angle than modern bikes so didn't wobble so much either. Road rash and a buckled wheel!! Don't use cleats! Or toestraps. Also, this is best done with drop-handlebarred bikes - trying it with two very widehandebarred-bikes is difficult. Ridding down micklegate on a sat night, over the cobbles, with staggering drunks and a red light at the bottom of the hill is also not good. Really doesn't work with either combination of flat-barred hybrid and folding bike. DAHIKT. I ended up walking them for several miles, one in each hand. Which was fairly awful. I've done it a number of times. I ride less agressively, a bit like when riding no-handed. Whether in the UK or Slovakia (ie. riding on the left or the right) I have to hold the spare bike with my left hand. I am right handed. It works well for me as that leaves me with a gear-changing hand on the bike I am riding. With cleats is fine - when you come to a standstill lean very slightly towards the spare bike as you are a 4-wheeled vehicle. In fact, it is easier with cleats as it gives you two extra points of firm grip on the bike you are riding. I do think when I am doing it whether the police would take a dim view, saying that I am not fully in control as I only have one brake I can reach. Not my boat. Now sold. +1. Except I hold the spare bike in my right hand. Ditto to the dim view by police, also being unable to now give handsignals. The starting and stopping is all predicated around the fact that you can be stationary on the two bikes without putting a foot down. Lean spare bike on fence. Move towing bike alongside, and straddle it. Apply brake with one hand, reach other hand onto spare bike. Put one foot on pedal of towing bike, engage cleat, lift bum onto saddle, clip other foot into pedal of towing bike. Wait for brain to realise that you're not going to fall over. Then release brake, and start riding. Slowly. The challenge is to apply this procedure to the one way system of New Cross. I'm going to see how much foam pipe lagging I have knocking around, before embarking on WJ's over-the-shoulder approach. I reckon that might work. You'll probably find a pedal spanner useful as well. It's usually posible to screw the pedal into the inboard side of the crank to prevent loss in transit (Que "If I had a van, I wouldn't have to ride 2 bikes at a time" joke). I recommend the pedal spanner for walking two bikes at the same time, too. Or shinpads. It's something you can only do as a kid. I used to do it all the time in the village where I grew up, as did everyone else. Tried to do it with #2 son's bike in Waleslandshire recently and had to give up and admit defeat pretty quickly. I've seen it being done in Central London, and tried it myself in Horsham Station car park, my results were as Jurek describes. This might be missing the point, but have you thought of riding the bike there and getting public transport back? I tried to do it once, with the help of a friend holding one bike, and me trying to ride alongside and grab it en passant. (There were two of us, trying to transport three bikes). Headtube/toptube join resting on shoulder. Back wheel forwards and down. Hand holding chainstay to stabilise & take the weight over bumps to reduce shoulder bruising - that's how I do it. 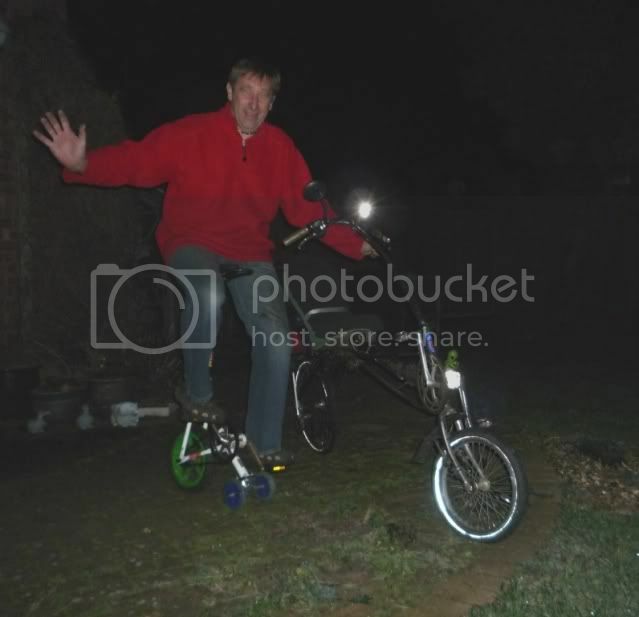 While I was out there, I experimented riding two bikes at a time round the grounds of Wobbly Towers. I found it much easier than I remembered. Riding the allotment MTB while pushing the fixie was easy - tight turns, 'trackstands' using bike No.2 as a walking stick. In fact I found it easier starting from one of these 'trackstands'. Further experimentation proved that using the Wobblebike as bike No.1 is perfectly feasible, but Wobblebike as bike No.2 was probably not a good idea. 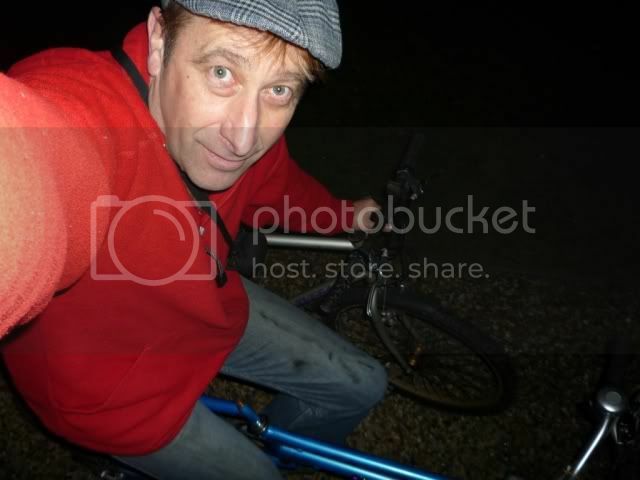 Difficult to get proof with only 10 secs of self timer on the camera, but here's a photo taken while on the Wobblebike (Yes, camera in one hand, bike No. 2 in other hand and both feet on the pedals). Great stuff, Wobbly. But where's Nutty? I want to see this done whilst riding a monocycle? It's so dark out here, you can hardly see me pushing a recumbent while riding a Skatebike. Wobbly, you are an inspiration. Page created in 0.211 seconds with 24 queries.